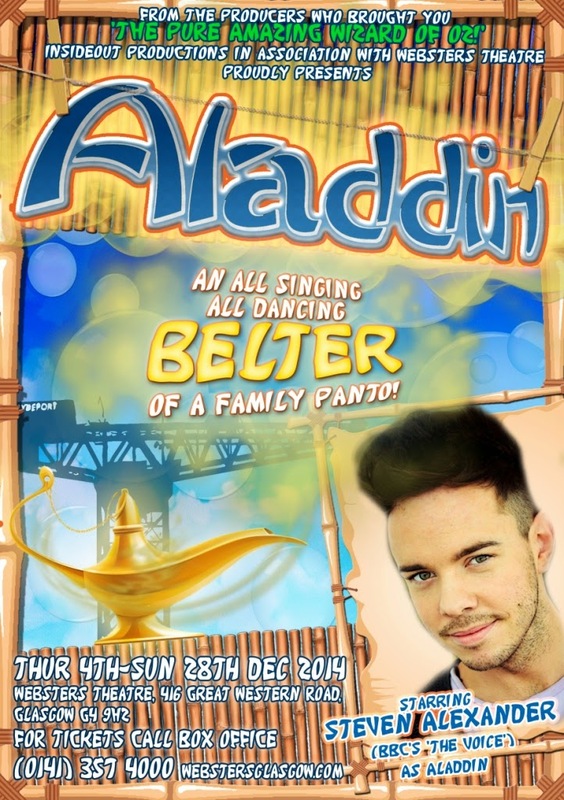 Aladdin arrives in Glasgow this festive season! The production company responsible for the smash hit panto 'The Pure Amazing Wizard of Oz' is back this festive season with its new offering, Aladdin. Insideout Productions in association with Websters Theatre proudly present their professional cast. Headed up by The Voice semi finalist, Steven Alexander - who is so excited to get back to his theatre roots and back on his home turf playing Aladdin. Joining Alexander is a whole host of Scottish actors including, Fiona Wood (Jasmine), Neil Thomas (Widow Twankey), Natalie Toyne (Abanazaress) and Grant Mcintyre (Wishee Wishaw). Written by Insideout's artistic director, Paul Harper-Swan, audiences can expect a 'modern day take on the classic story, with lots of singing, dancing and the good old Glasgow banter'. This is a panto that should not be missed! Aladdin will run at the Websters Theatre (opposite Kelvinbridge Underground) from Thursday 4th December to Sunday 28th December 2014. Tickets are £13 and selling fast.